I have a zodiac pro 420 Rib. Only 4.2 m so not slot of space on board. I have a fixed auxiliary mounting bracket on the rear transom. The Honda 2.3 auxiliary doesn’t have a strong bracket itself and when pulled up in the stored position when travelling I know with the bouncing the rib does it’s going to snap that bracket. Other than removing it from the fixed auxiliary mounting on the transom and keeping it in the boat somewhere has anyone any recommendations for securing or supporting an auxiliary in the lifted position on the transom. You can fit a stainless steel U bolt to the deck. Use Sikaflex too. With the auxilliary engine in the tilt position, fit a ratchet strap through the pull start opening around the engine block and back to the U anchor point and ratchet tight. I agree, without this you'll break the auxilliary tilt bracket. Lastly, flush the auxilliary, even if you haven't used it. I have a long shaft Mariner 4hp and the tell tale and impeller are prone to salting up. In an emergency, if you needed the engine deployed quickly, cut the ratchet strap with a knife. Incidentally, the adjustable bracket I used on my Zodiac Pro was a waste of time. It rattled like a Vauxhall Viva on a frosty morning! I dont know if the way I do mine will work for you Bremar ..but it sure works fine for me and it costs a penny. A rope bridal that fits over the Aux head and is tied off on a mounting ring on the transom. The bridal just lifts off if I need to get the Aux in the water in a hurry..but after I undo the knot on the mounting ring. I can also force it off if Im in a desperate hurry. I have used various AUX mounting brackets on other boats in the past but always found they rattled like a bag of spanners no matter what I tried. If there is room on the transom..IMO its best there but I appreciate it is not always possible. A bridal may help though. PS Just notices Spartacus posted as I typed.. basically the same info .. slightly different securing . Thanks for the replies and the link to a similar question. I’ve ordered a stainless steel ratchet strap. I will probably have to limit the amount of lift on the auxiliary because in the fully lifted position the prop sticks out beyond the back of the tubes.this is because the fixed bracket on the transom pushes the auxiliary further out. I’ll get there in the end. Thanks again. 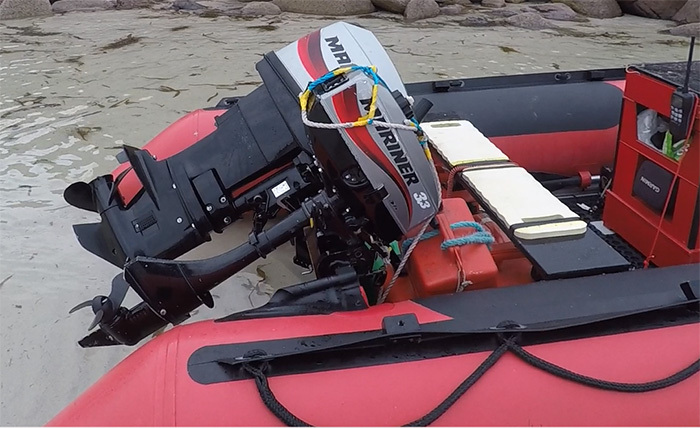 i wouldn't worry about it sticking out especially at sea if you trailer just set it on shallow drive and secure, if possible with a piece of wood between the engine and the clamp so it takes strain off the mechanism. Have you ever had to use the Auxiliary in a real life situation ? I guess your suggesting an auxiliary for many of us is realy unnecessary.